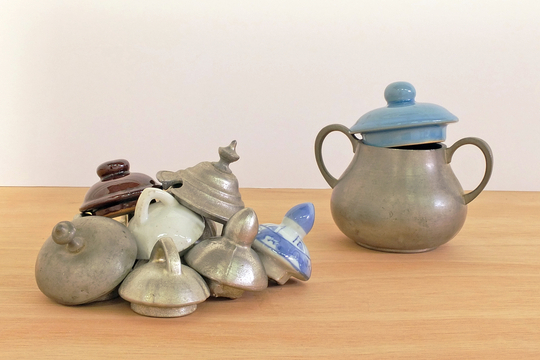 Venetia Dale, there you are, found and cast teapot tops, 6x13x12 in. Venetia Dale is a metalsmith/sculptor whose work explores shifts in utility, mobility and exchange between people, place and things. Dale received her MFA from State University of New York at New Paltz in 2009 and BFA at University of Wisconsin-Madison in 2004. She exhibits her work, lectures, curates and performs workshops nationally and internationally. Dale recently exhibited work in a two-person show 92nd Street Y Tribeca Gallery in New York, Urban Institute of Contemporary Art in Grand Rapids, MI and at Eastern Bloc Centre for New Media and Interdisciplinary Art in Montreal, Quebec. She was artist in residence at Oregon College of Art and Craft in 2010 and recently completed an art/industry residency at Kohler Co. in Sheboygan, WI. Venetia Dale resides in Boston, MA where she maintains a studio practice and teaches at Massachusetts College of Art and Design.